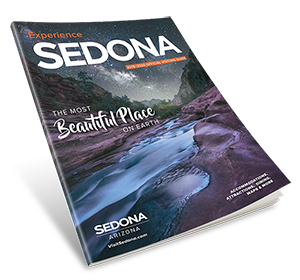 The exquisite luxury, the stunning scenery and the inviting warmth of Sedona all combine to create a magical destination for romance. And for weddings, it is a setting that spills from the pages of storybooks. 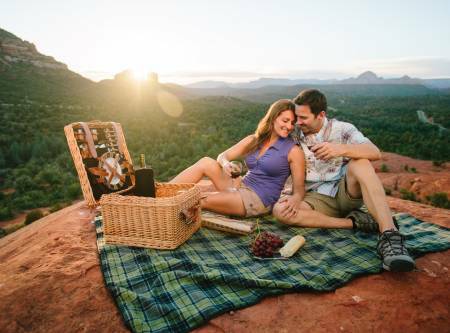 Romance is woven into the very fabric of Sedona. This is a town founded on love. The first postmaster T.C. Schnebly struggled to come up with an appropriate name for the young community surrounded by iconic red rock monoliths and nestled along the banks of Oak Creek. Finally, he did the most natural thing of all. He named it after his beautiful wife, Sedona. Start with the assortment of stunning backdrops. While there are a number of dramatic chapels, churches and resorts framed by the red rocks, many lovebirds prefer to venture outdoors. Exchange vows atop a high mesa, tucked away in a hidden canyon, on the banks of a silver stream or beside a favorite formation bathed in the lush glow of sunset. Or perhaps you’d prefer to tie the knot aboard a hot air balloon or helicopter. Hire a fleet of jeeps to take you and your party into the secluded, glorious outback. 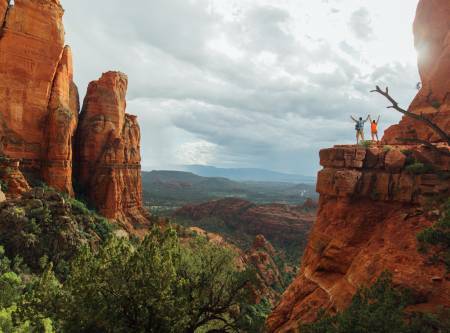 It’s your special day and in Sedona, the possibilities are as endless as the rising spires, buttes and mesas that stretch as far as the eye can see. For wedding ideas in Sedona, the most beautiful place on earth! Click here for Inspiration. Sedona boasts an impressive infrastructure of matrimonial experts. Couples will discover a talented array of wedding suppliers in Sedona that include wedding planners, florists, caterers, musicians and wedding cake designers to name but a few. Photographers and videographers, intimately familiar with the beautiful landscape and flattering light, will capture every cherished detail. These are people who specialize in creating unforgettable moments and wedding can be tailored around virtually any budget, from elaborate to simple, from traditional to whimsical. To find the perfect wedding supplier for you click here for Vendors. Take advantage of our Partners’ special offers and money saving discounts. The perfect wedding happens when there is the magical combination of well-tended to details paired with your amazing journey of love. Sedona’s wedding site offers an myriad of useful tips for your perfect wedding day from checklists, listing of wedding website services and local wedding planners. See below for our Wedding Checklist to get started on your wedding plans. 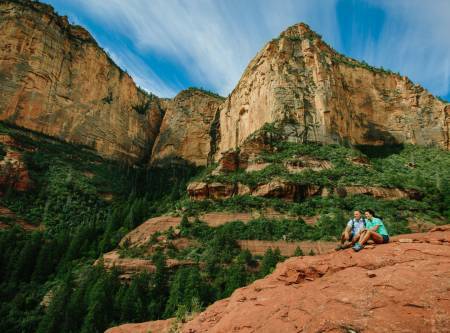 A ceremony of love in Sedona means the possibilities are as endless as the rising spires, buttes and mesas that stretch as far as the eye can see. Experience the most beautiful day of your life, in the most beautiful place on Earth. To help you with your wedding plans we’ve gathered a few of our favorite wedding tips and ideas. When we think of our dream wedding destination we imagine turquoise blue skies with billowing white clouds, we feel the softest of breezes winding through majestic red rock mesas, we see beautiful meadows warmed by the high-desert sun and we want everyone at our wedding ceremony to experience it with us. We know you have imagined your dream wedding too and you want it to be perfect. To help set your wedding plan priorities and keep it as stress-free as possible check out our Sedona Wedding Checklist. Traditional, yet modern. Creating your own wedding website is a wonderful way to save printing costs as well as being eco-friendly. Sending out invitations directing guests to your personalized website with all the details of your wedding brings together modern technology with the most time-honored celebration of love. Wedding websites are great for collecting all the information that you can’t fit in your wedding invitations: registry information, hotels, directions, pictures, RSVPs and general information you want to share with your family and friends. We’ve gathered a list of wedding website services to help you find one that is the perfect fit for your wedding. View a list of wedding website vendors. One of the most important things to consider when choosing a wedding date is the personal significance of the day. Other decisions on date include considering your celebration must-have’s and making sure your wedding date falls in the season they will be available; and whether your ceremony will be during a Holiday season or a quieter time; and if your date fits your work schedule and your family and friends schedule. Another important consideration for your wedding date is if there are any city-wide community events or festivals that can create logistical challenges or that you want to include as part of your wedding celebrations. To help select your wedding date go to our Events Calendar. Saying “I do” to using a professional wedding planner is an important decision. If a wedding planner is for you, Sedona has a wide array of professionals dedicated to making your wedding unforgettable. 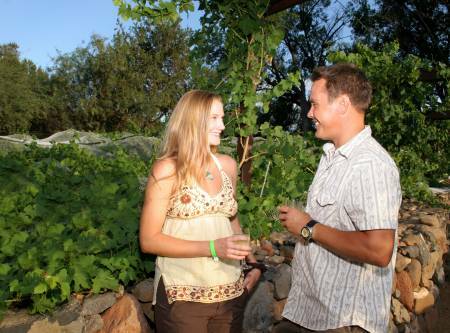 Find your Sedona Wedding Planner. Find the perfect location for your Sedona wedding. Get inspired by the beautiful wedding options in Sedona. Put the finishing touches on your wedding planning. The options to get married in Sedona are endless.